These are all free WordPress business themes for every kind of business and corporate websites. Business Themes are the commercial side of WordPress. Web designers use these themes to create business websites which require frequent updates. That’s because the client can update his website using WordPress’s dashboard. Of course, he can’t do that with an HTML/CSS based website. So if you are a web developer/designer who often works with business clients and WordPress, you must check out these themes. I should also mention that a couple of magazine themes are also included in this post. That’s because they seemed fitting for business themes usage as well. If you like our effort, don’t forget to comment. This is a modern, clean and absolutely free theme for WordPress. It is packed with a lot of useful built-in features. Most suitable for business sites but highly customizable. Perfect theme for large scale companies and corporate houses. With an advanced admin panel, you can customize it exactly according to your needs. Also works as brilliant portfolio theme. Theme features 9 Page Templates, 11 Widget Areas, 6 Template Layouts, 4 Menu Positions and more. Crom CyberChimps WordPress Themes, this is a Professional Responsive Business WordPress Theme perfect for any business on any device. I’ve personally used this theme and I love it for its simplicity. I had the whole site up and running in less than an hour. A very neat and clean black and white business theme. The theme supports widgets. And features theme-options, threaded-comments and multi-level dropdown menu. A simple and neat typography. Another neat and clean theme. I recommend this is you are gonna update the website frequently. Yasmin will adjust itself to the screen size of various devices used to browse the web. Let that be your desktop, laptop, tablet or even your smart phone. It is not only the site layout that is responsive, even the media elements like images, slideshows and videos are responsive in this theme. This is based on the skeleton Framework. This theme is also powered with features like custom post type, taxonomies, custom menu, featured thumbnails etc.Portfolio post types are used to display your portfolio items. This theme supports 2 portfolio items. BizWay is one of the easiest themes with the presence of Theme Options Panel, makes it easy for you to have your Website for your Business or Personal Use in Minutes. The Theme features a designed Home Page and a blog page template and is widgetized. 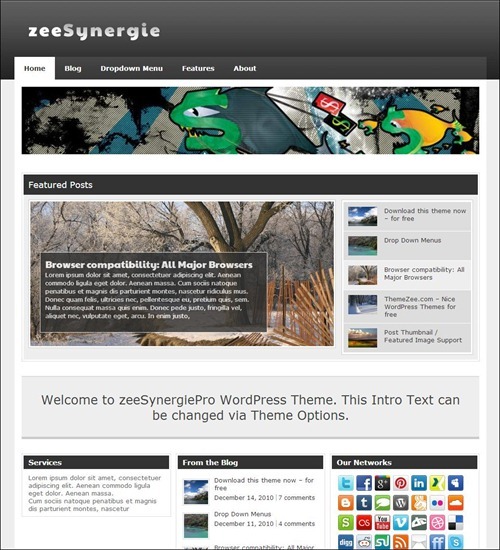 zeeSynergie is a two column wordpress theme in an elegant and sleek design that fits perfectly for a blog or small business website. It is featured with a nice theme option panel where you can upload your logo, pick one of nine color schemes or choose your own one via colorpicker. The theme comes also with a beautiful featured post slider (3 options – fade, dropdown, horizontal), a banner ads widgets, integrated social media buttons, custom footer and a dropdown navigation. Rolex theme is a premium quality free business theme. So if you are a service provider or product vendor this theme could power your website in an elegant fashion. Theme holds a jQuery slider on top and there is a widgetized section on the home page to list out your services or products in style. The blog section is arranged in a grid fashion. Nomad theme has a two column design with a jQuery featured image slider. The widgetized sidebar features on the left with a logo placeholder with css3 animation effects. Theme comes with features like custom menu, featured thumbnail etc. The sidebar holds a twitter widget. Theme also comes with an options page. Learner is a high quality free General/Blog WordPress Theme. Comes with easy to use options page. Upload your logo and favicon. Ready to use custom widgets and featured posts slider. Delicacy is a culinary WordPress theme created with food blogs in mind. It is also a perfect choice and can be easily adapted for personal blog, as well.